Paul Newman as Butch Cassidy in Butch Cassidy and the Sundance Kid. There remains some doubt as to who the two men really were, but they were believed to be the thieves of a mining payroll stolen five days earlier. These thieves were better known to history, and film, as Butch Cassidy and the Sundance Kid. Robert Leroy Parker was born on April 13, 1866 in Utah and worked on ranches in his youth. As one small crime led to another, Parker soon was known throughout the western part of the country as “Butch Cassidy”, one of the more successful bank and train bandits whose colorful adventures with his gang, the Wild Bunch, involved much more blood than the 1969 film would have you believe. Eventually, Butch and his long-time partner-in-crime, The Sundance Kid, hightailed to South America, where they tried their hands at working a ranch before the call to crime grew louder. Thus, the men found themselves holed up in a boarding house, facing arrest or death. They chose the latter, with murder-suicide being the accepted story for the end of Butch Cassidy and the Sundance Kid. The story doesn’t end there. Whether or not Butch and Sundance actually escaped South America is up for debate, with some saying the two lived on well into the 1950s in America. However, William Goldman wrote a highly fictionialized but radically entertaining screenplay, Butch Cassidy and the Sundance Kid, which was brilliantly directed by George Roy Hill and perfectly acted by Paul Newman, as Butch, and Robert Redford, as Sundance. It’s likely that we will never find out for sure what happened – or who really died – in that San Vicente boarding house. But if Butch and Sundance were anything like the guys played by Newman and Redford, they’d probably get a kick out of us not knowing. Unlike Sundance, who rotates his shirts while in Bolivia, Butch wears the same consistent everyday wardrobe throughout, consisting of a light brown corduroy jacket, a pale blue shirt, dark trousers, and the necessary hat, boots, and gun belt. Butch’s light brown corduroy jacket is a single-breasted 3-roll-2-button sport coat with notch lapels rolling over the top button. There are flapped hip pockets but no breast pocket. The shoulders are slightly padded and there is a subtle seam running vertically down the rear center of his back. The 2-button cuffs match the three buttons on the front of the jacket. The corduroy is a standard wale, making it identifiable even from a moderate distance. Butch in various states of action. The pale blue shirt is a lightweight casual work shirt. It has white buttons down a front placket and buttons at the end of each cuff. There are two patch pockets on the chest – one on each side. Imagine wearing a corduroy sport coat in the tropical heat of South America. No wonder Newman was so quick to ditch it between takes. Butch’s trousers are dark olive brown flat front with large belt loops and plain-hemmed bottoms. Butch is able to wear a very wide dark brown leather belt through the large loops of the trousers, fastening it in the front with a large tarnished brass squared clasp. Ah, the “paintball” blood of the late ’60s and early ’70s… I doubt/hope that many of you will ever get shot in the leg, but have you ever actually seen blood that vibrantly on clothing? Sometimes gunshot victims in movies of this era look like they’d belong more in a rave than in a gunfight. When he is out riding or robbing, Butch wears a brown leather gun belt around his waist as well, with ammunition around the rear and his Single Action Army dangling from his right hip. This gun belt, with detailed edge stitching, fastens with a squared silver clasp on a front strap, giving it extra support around Butch’s waist. Poor Butch hardly even gets a chance to show off his gun belt, as that flashy Sundance hogs all the good shootin’ time in the film! This being a Western and all, Butch’s look wouldn’t be complete without his hat and boots. His hat is a dirty off-white “cowboy” hat with a short upturned brim and a striped band in dark brown and green. Like Sundance, it has a low crown and a flat top. However, Sundance’s is black, perhaps using the classic black hat vs. white hat motif from Westerns to indicate the contrast between Sundance’s darker nature and Butch’s more carefree “I never shot anybody” nature. One would be hard-pressed to try and call this a sinister-looking hat. Butch naturally wears a pair of distressed leather riding boots. His are brown to match the rest of the earthtones in his attire. Underneath, Butch sports a ragged light gray union suit, leaving the top unbuttoned. 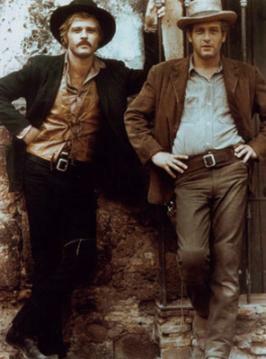 The difference in attire between Butch and Sundance is undeniably intentional. Whether in the United States or Bolivia, Butch wears earthtones. Even his suit is dark brown. Sundance, on the other hand, is always prominently sporting black. In the United States, he wore a black shirt and trousers and even had black incorporated on his jacket. His suits are differing tones of gray and charcoal. In Bolivia, Sundance even wore an all-black suit. Sundance also always wears his black hat, where Butch wears a dirtier off-white variant. In fact, all of Sundance’s accessories – hat, holster, and boots – are black, whereas Butch’s are shades of brown. What does it all mean?! In my opinion, it is the symbols of their professionalism. Funny or not, these men are criminals. Sundance takes it seriously, dressing in serious blacks and grays. Butch is the more down-to-earth of the two, thus he wears earthtones. So what makes Butch so different from Sundance? Through the film, although he can banter with the best of them, Sundance is the consummate professional. He does his job cleanly, honestly (relatively, for a bandit), and without complaints. He doesn’t take things too personally, nor does he resist when he’s called on to act. Butch, on the other hand, somehow managed to attain the position of gang leader despite a much more laissez-faire attitude toward his work. He doesn’t back down from little white lies (impersonating a train passenger) or lies by omission (“I never shot anybody…”). His work often leaves a mess (“Think you used enough dynamite there, Butch?”), and if something goes wrong, he’s gonna talk Sundance’s ear off about it. Only a guy like Butch could find time to relax in the middle of a gunfight. The specialty of the house and it’s still movin’! What’s even more surprising about Butch’s position as leader is his lack of professionalism. Harvey Logan, his only challenger to his position, may have been a Neanderthal brute, but you could tell he would’ve led a brutally successful gang that wouldn’t have blown up its own money. Butch even takes Logan’s advice about train robbery after defeating him in a clever – but again, dishonest – fight. Unable to remember the words, Butch pulls out a crib sheet, to Sundance’s horror. Sundance: They got ‘em up! Skip on down. Butch: Todos ustedes arrismense a la pared. Sundance: They’re against the wall already! Butch: Donde… Ah, you’re so damn smart, You read it! No, Butch, you weren’t that funny in real life. 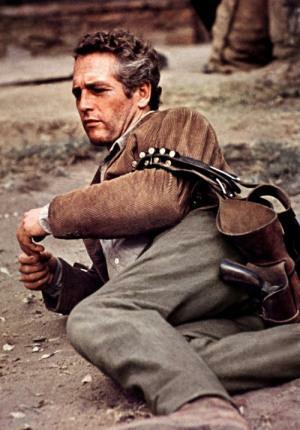 But Paul Newman was, and it is Newman’s classic and fun performance that helps make the film so memorable and rewatchable. Sundance as a dark gunman next to the more down-to-earth Butch. Unlike Sundance, the darkly-dressed gunman, Butch wears a more casual look that – hat and boots (and probably gun belt) aside – would still translate nicely into a good look today. Like his buddy Sundance, Butch Cassidy carries a Single Action Army “Quickdraw Model” with a 4¾” barrel throughout the film, although he isn’t nearly as proficient as the Kid. Butch: Kid, there’s something I ought to tell you. I never shot anybody before. A Colt .45, definitely the choice of Old West badasses. 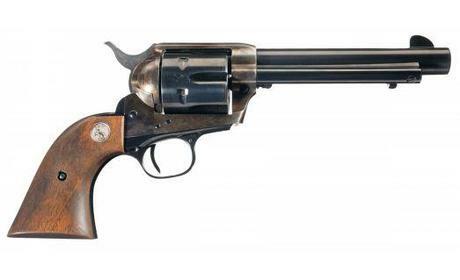 The Single Action Army has gained a legendary status as “the gun that won the west”. The original Single Action Army was developed by Colt in 1873 and has been alternatively known as the “Colt Peacemaker”. Although primarily offered in .45 Long Colt, the revolver has also been offered in a variety of chamberings from small .22-caliber rounds to the massive British .476 Eley rounds. To read more about the Single Action Army and, in particular, its use in Butch Cassidy and the Sundance Kid, check out my other post about Sundance himself or just go read what the folks at Wikipedia have to say about it.